Gucci's eyeglasses are designed with the high fashion and elegant sophistication that has been synonymous with the Gucci name. Gucci's styles range from decorative and delicate metal frames and timeless classics to more modern, streamlined styles and bold frames with rich, exciting colors. Gucci glasses are designed for fashion savvy individuals who know that the Gucci name truly carries a lot of weight. Gucci's sought-after styles appeal to many aesthetic sensibilities, and they always uphold Gucci's commitment to fashion excellence. Gucci GG0453O is a Full Rim frame for Men, which is made of Acetate. Acetate is the most common material used for frame manufacturing. It has endless possibilities for color, texture, and patterns. It can even be laminated to create great visual effects, and it can retain a higher luster. Acetate is lightweight, so it is often chosen for its versatility in coloring as well as for its comfort. Acetate is made out of cotton seed fibers and plasticizers. This model features a Rectangular shape, with a Single Bridge. These Eyeglasses work well for people whose style is: Stylish Designer. 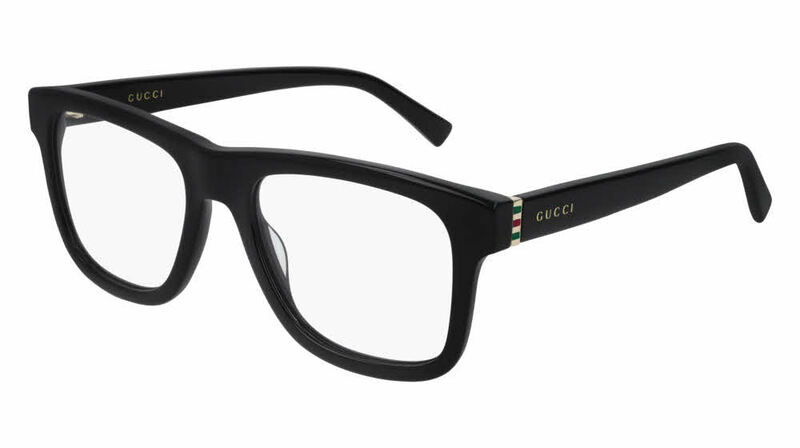 Gucci GG0453O Eyeglasses come with a cleaning cloth and protective carrying case.